As designed by Karen Bengel, the main living space features a comfy Lissoni sofa and a leather Kyle Bunting rug. With DC’s plethora of historic districts and period homes, sometimes the move toward Modernism comes from the bottom up. Such was the case with the basement makeover in a Logan Circle townhouse that designer Karen Bengel of Design Milieu recently re-imagined for a family of four. A spare front entry leads to the finished basement. With the green light to take the basement into the 21st century, Bengel set about transforming it from its rudimentary, close-to-unfinished roots to a clean-lined, well-lit, comfortable space where the homeowners and their two young sons could relax together and entertain friends. The space now boasts a kitchen, an expansive family room, play space, built-in desks for each boy and an exercise area. “I am fascinated with Modernism, but my take on it is warm and cozy, with lots of textures and finishes,” says Bengel, who worked on the project in concert with architect Donald Lococo and Cornerstone Renovation Management. 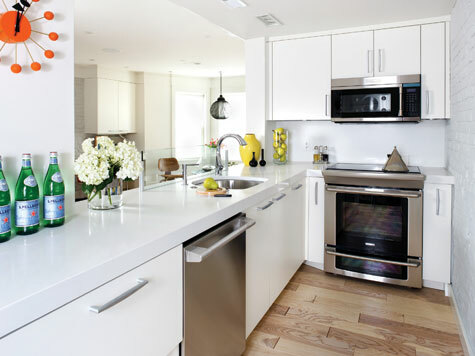 A full kitchen equipped with a stove, microwave and dishwasher caters to adults and kids alike. To achieve that aesthetic, Bengel opted for engineered ash flooring in a matte finish that’s slightly whitewashed, which allows the grain to shine through. An electric radiant heat mat was installed under the floor so the residents would always be cozy. She also chose to restore, rather than replace, the room’s exposed brick walls, which she then had painted a warm neutral color. The patterned Kyle Bunting leather rug layers additional inviting texture in the main family room. A Lissoni sofa—“one of my favorite pieces in modern furniture,” says Bengel—is covered in soft, durable Ultrasuede and beckons all comers. “In addition to the kids, they also have two dogs who love to lie on the furniture, so it was important to get something stain-resistant and easy to clean,” says the designer. The sofa faces a large flat-screen TV mounted on the wall; to the right, a low table on a round, orange-rimmed rug is a perfect spot for games. The client’s favorite shade of bright orange contrasts to the pale painted-brick walls. In a nod to her client’s favorite color, orange, Bengel accented each room with pops of the bright hue. Orange accents spread joy in the form of wall décor, an eye-catching wall clock, pillows adorning the sofa and even a highly structured chair. “We talked about how to make the orange sophisticated and warm, punching up the generally neutral palette,” Bengel says. The egg chair in the family room is a popular spot for the kids but also has an edgy air that makes it perfectly at home in an adult gathering. At the top of the family’s wish list of amenities was ample storage for the kids’ growing gaggle of toys. “They had more Legos than I’ve ever seen in my life, and all kinds of toys that needed to be stored,” Bengel says. Her answer? A series of storage closets running down a long hall whose paneled doors resemble a simple wall. A low table makes the perfect spot for games played under a pendant from Y Lighting. Although the basement clearly has a personality of its own, Bengel says one of the nicest aspects of the design is that it winks playfully at the rest of the house. “There are definitely some things we did that were a nod to the traditional space upstairs,” she says. Transitional elements include the wall paneling and crown molding that, even with its flatter reveal, ties in with the traditional décor. 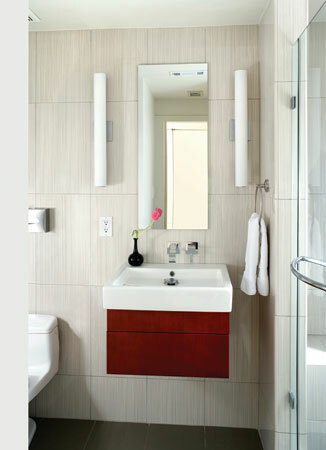 A bathroom is concealed behind paneled doors.